Convert V4 portable is an entire suite of software tools designed for high-volume, high-fidelity media conversion. The user interfaces are designed for smooth and logical handling – even when dealing with thousands of source clips and multiple projects. 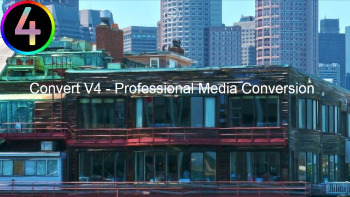 While Convert V4 was built originally for converting video formats, it is also well-versed in audio conversions, image sequence conversions, video stabilization, archiving and file renaming – plus comes complete with Waveform, RGB Parade, Vectorscope and Histogram scopes for detailed analyses of on-location video. For converting image sequences into video, check out the new im2 application designed to add new features to the Convert V4 image sequence processing pipeline. im2 currently supports TIFF, EXR, DPX and PNG image sequences and renders H.264, H.265, ProRes, MP4 HQ, QT RLE, MJPEG, DNxHD and OP Atom video formats with similar options as Convert V4 and video. Handling of im2 is based on Convert V4 so use remains familiar between applications. • New Monocle Retro Monochrome RAW Image module. • New stabilizer module – stabilize shakey footage automatically! • New – MPEG4 HQ MP4 high quality, smaller file size – great quality! Anamorphic shooters can easily correct display aspect ratio while converting to most available codecs, rescale and adjust aspect ratio with select codecs, or elect to quick-wrap with aspect ratio correction only (using Wrap to MOV). Scale down 4K and HD footage to half-size ProRes 4:4:4 or DNxHD 4:2:2 with the highest possible quality. V4 uses separate luma and chroma scaling to eliminate aliasing and artifacts associated with standard scaling algorithms. Apply a correction LUT or curve while downscaling, select the input luma range (for GH4 or Canon cameras), burn-in timecode, correct aspect ratio for anamorphic shots or crop to cinematic frame size. Use the H.265 conversions with your 4K clips to make them easy to play on almost any PC, reduce file size and to maintain very high quality. Try the MPEG MXF conversions for moderate file sizes, very high quality and easy 4K playback in most applications. Shooting at a high framerate? Convert V4 provides speed / pts functions for super-smooth slow motion. Convert V4 also provides the ability to change framerates with proper audio rendering (24-25fps, 24-30fps, 25-24fps, 25-30fps, 30-24fps & 30-25fps). Works with most formats and conversion codecs (SD, HD & 4K). Excellent conversions for Avid, DaVinci Resolve and Premiere Pro – OP Atom! For Avid users Convert V4 provides automated conversions to native OP Atom formats. Each conversion will contain a video file with accompanying audio files for each channel of original audio. These can be ingested directly into Avid simply by refreshing the database once files are in the proper location. Convert V4 also provide super-fast wraps for converting existing .MXF format files to OP Atom for direct ingest into Avid. Convert V4 provides Avid DNxHD and DNxHR high quality intermediate conversions with timecode and reelname support for most HD formats up to 1920×1080. Conversion times are fast and output files are compatible with most pro NLE applications. Most software players can handle DNxHD easily too. Apply a 3D LUT to an entire batch of clips in one easy operation. A color picker function is also included to provide RGB and HSL information for pixels currently under the cursor. The V4 Video scopes can be used with most any input format and have been extensively tested for accuracy. The Convert V4 timecode tools provide an easy way to re-assign timecode to your clips. The timecode tool will automatically calculate timecode for each clip in the media pool in perfect timecode sequence. You may also set your own timecode for each clip by typing the values right into the startTC timecode fields. V4 automatically calculates the total number of frames and the end timecode for reference. Add a running timecode display to your intermediate conversions with a single-click of the burn TC button. V4 will use existing clip timecode if present or will derive timecode from the file creation timestamp. You may also elect to zero the timecode for each conversion. Available with select codecs. Convert V4 will create 5.1 Dolby Digital or DTS audio from your stereo audio by generating 6 discreet audio channels quickly and easily. Each channel is optimized and equalized for 5.1 surround sound including rear channel delay, center channel voice equalization and LFE subwoofer frequencies isolated for true surround sound. Add an extra level of professionalism to your next project! You can playback your surround files with most DVD or BluRay player applications. Windows Media Player may also be configured for 5.1 playback. Use the 6 discreet channels created from your stereo source by Convert V4, or 6 channels from your audio DAW application to create a single .ac3, .dts or .wav 5.1 surround sound file. Use the Audio Format Converter or the Surround Tool to create a properly trimmed audio track for your project with fade-in and fade-out, then add that audio track to your video clip using the Video / Audio merge Tool. The interface provides duration info for both video and audio inputs to easily spot length mismatches. Use the Stabilizer tool to help smooth out shakey handheld videos – works with most input formats. The default settings are good for most cases.